Available from KRSS a used fully refurbished and service AB SCIEX 4500 QTRAP with Shimadzu UHPLC. 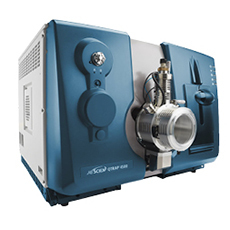 The SCIEX 4500 Series is next-generation technology from the leaders in mass spectrometry. Redesigned from the foundation of our industry standard triple quadrupole mass spectrometers, the 4500 Series introduces a new era of LC-MS/MS performance. An era defined by fast, precise quantitation and ultra-fast triple quadrupole scan speeds - an era that™s ideal for UHPLC. QTRAP technology provides a new level of selectivity and confidence. Unique to SCIEX mass spec platforms, QTRAP Technology delivers up to a 100X increase in full scan sensitivity over basic triple quads, enhancing qualitative workflows while offering versatile advantages in simultaneous quantitation and library searching workflows. The MRM3 workflows enabled by the QTRAP 4500 system provide enhanced quantitative selectivity when high background or challenging co-eluting interferences make standard MRM quantitation difficult.